Dinnerly Review: Is This The Quickest & Least Expensive Meal Delivery Service? With so many meal delivery services on the market today, it can be hard to distinguish between each to choose which one is right for you. However, if you’re looking for a service that promises quick and easy recipes, with only six ingredients per dish and is only $5 per serving, Dinnerly might just be your new go-to meal kit. Although their meals are quick, our review showed us that they are packed full of flavor. They do this focusing on simplicity rather than complexity in their recipes. The first step is to choose the box you’d like to order. They currently have two different options, which includes a two-person box and a family box. The two-person box provides you with three recipes per week and two portions per recipe. The family box also gets you three recipes per week, but you’ll receive four portions for each dish (to accommodate more people). Once you’ve chosen your box, you’ll be prompted to enter your zip code and your email address. By submitting your zip code, this will allow Dinnerly to determine if you are within their delivery area. They don’t ship everywhere yet (more on that below). If you are within their delivery area, you’ll be taken to a page with available dates when your box will arrive. Each week, you’ll be prompted to log into your account to review the available recipes. In your account area you will be able to view the three set weekly recipes, and the full list of ingredients that will be sent to you to cook the meals in your own kitchen. 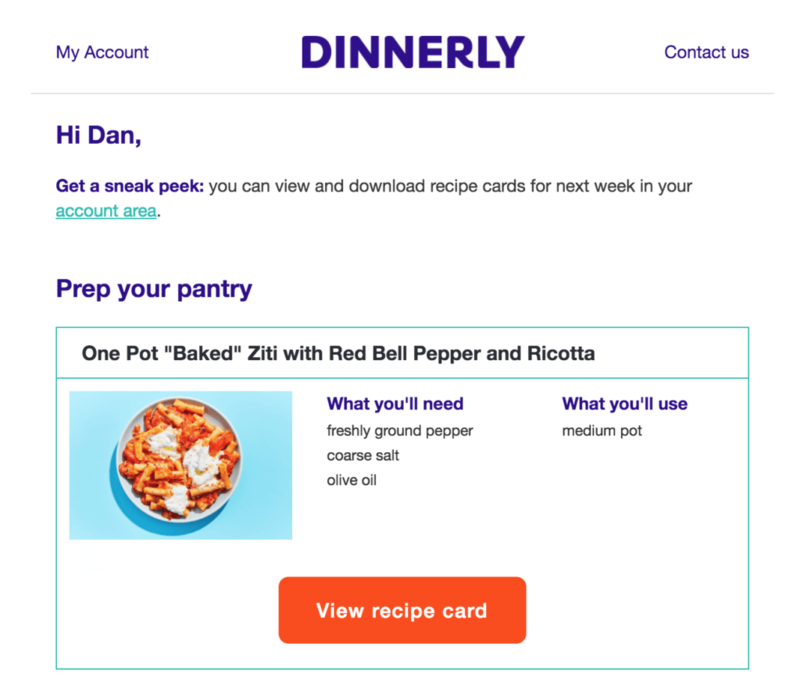 Dinnerly, unlike other subscriptions services is very flexible, and allows you to to plan your deliveries up to one month in advance (if you want). One of the great things about a meal delivery service like Dinnerly is that you don’t have to worry about getting stuck in a food rut. Each week, you’ll be provided with new recipes to try that will help expand your palate by getting you tasting different dishes. However, their recipes aren’t so far “out there” that they won’t suit picky eaters. In fact, they’re actually pretty straightforward. We received One Pot “Baked” Ziti with Red Bell Pepper and Ricotta, Gingery Chicken Soup with Sweet Potatoes and Spinach, and Chorizo-Broccoli Quesadilla with Cheddar and Sautéed Onion in our first box. When reviewing your Dinnerly meals each week, you’ll be able to see how they’ve categorized each dish. This will help you select the ones that are best for you. They also label anything that happens to be vegetarian, dairy-free, or gluten-free. One thing to note is that while they have vegetarian, dairy-free, and gluten-free options, they do not have exclusive plans to fully accommodate these diets. At this time, Dinnerly has a specific delivery area that they cover. They ship to most zip codes within the following states: California, Washington, Oregon, Nevada, Utah, Idaho, Texas, Illinois, Iowa, Wisconsin, Georgia, Colorado, Oklahoma, Louisiana, Arkansas, Indiana, Kentucky, Tennessee, North Carolina, Virginia, New York, Maryland, Connecticut, New Jersey, Massachusetts, Rhode Island, Pennsylvania, and Florida. They also deliver to Washington, DC. If you are currently outside of Dinnerly’s delivery area, you should contact them to see if they have plans to deliver to your state any time soon. They are in the midst of expanding. When placing your order, you are able to select your own delivery date based on the options available for your area. This means you’ll always know when your order is going to arrive so you can plan accordingly. Do keep in mind that you will have to pay for shipping on your order. Dinnerly charges a delivery fee of $8.99 per box, so you’ll want to factor that into the final cost. Because you’re receiving fresh ingredients inside your box, everything needs to be kept cold during transportation. To do this, Dinnerly uses both ice packs and insulated liners to ensure optimal freshness. This means you don’t have to worry about your food spoiling before it makes its way to your doorstep. inside. It’s non-toxic and non-hazardous, so there’s no issue putting this into your trash can. 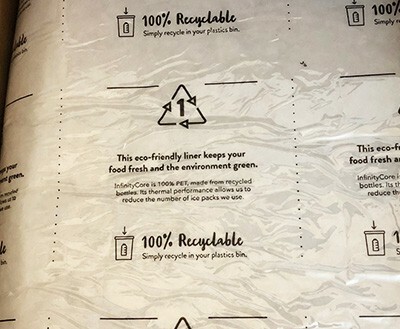 The plastic can then be recycled at a facility that takes #4 plastic. You can also take the paper bags and boxes to your local recycling facility. Their CMS liner is made from recycled PET bottles, which can also be recycled. You’ll notice that these are labeled, “#1 PETE.” And of course, don’t forget to recycle the remaining plastic as well! As mentioned, all of the ingredients for your meal are kept cold during transportation thanks to ice packs and insulated liners. This helps to ensure optimal freshness so you can feel confident about the food you’re about to prepare for you and your family. Dinnerly notes on their site that meat, fish, and dairy products can remain in your fridge for up to four days. So, you’ll want to plan on preparing your meals in the days after they’ve arrived, as opposed to letting the ingredients hang out in your fridge for too long. Dinnerly sources fresh fruits and veggies for all of the meals they send. They also provide you with grass-fed ground beef, antibiotic-free chicken, American-caught shrimp, and more. When it comes to meal delivery services, one of the major reasons why people choose to use them is because they’re trying to save time. If you’re one of those people, Dinnerly could be just what you’re looking for. Out of the 100+ meal and food delivery services we’ve tried, we found that their meals are one of the quickest to prepare. After timing each of the recipes from prep to the final meal, the average cook time was about 15 to 20 minutes. One of the reasons they’re able to make everything so quick and easy for you is that they’ve committed to using just six ingredients in their meals. That means there’s less ingredients for you to prepare, quicker to cook, and less clean up. Before cooking, you’ll want to make sure you have some kitchen essentials on hand in order to prepare each meal. Keep your kitchen stocked with the essentials like oil, salt, and pepper because you’ll need them frequently. However, if there’s anything else you’ll need to have in your pantry, Dinnerly will let you know ahead of time. They’ll even send a reminder of basic ingredients to have when they send your shipping confirmation. Dinnerly has truly succeeded at putting together simple dishes that are still delicious and flavorful. To think that these meals only contain around six ingredients is really impressive. It serves as a reminder that quantity does not equal quality. The first meal we made was their Chorizo-Broccoli Quesadilla with Cheddar and Sautéed Onion. It came with 5 ingredients: flour tortillas, fresh chorizo, sharp white cheddar, red onion, and broccoli crowns. Total cook time was about 15 minutes. I don’t think we’ve ever made quesadilla’s at home before until cooking this dish. But I have to say that I was impressed with how this came out. Dinnerly had us bake the quesadilla in the oven, rather than on the stove. The tortilla ended up perfectly light and crunchy, which made the whole dish really delicious. The Gingery Chicken Soup with Sweet Potatoes and Spinach was also a favorite of ours. It was so simple to make that we literally didn’t even need to bookmark the recipe to cook it up again. And we will, because it was mouthwateringly good—perfect for a cold winter day. The last dish we made was their One Pot “Baked” Ziti with Red Bell Pepper and Ricotta. Since the other two dishes we made were so good, I think this one didn’t impress us that much (even though it was good). In the future we’ll probably stick to their non-pasta dishes. When it comes to pricing, how much your Dinnerly subscription costs depends on the box you choose to order. As mentioned, they have a two-person box and a family box. The two-person box costs $38.99 per week, while the family box costs $68.99 per week. No matter which option you choose, you’re looking at a cost of $5 per meal. There’s also an $8.99 shipping fee, which is factored into the final cost. When you consider how much it costs to eat out or shop for groceries, it’s really not a bad deal in the end. In fact, this meal delivery service could very well help you save money and time on your weeknight dinners. Dinnerly is quite inexpensive when you compare prices with other subscription services. 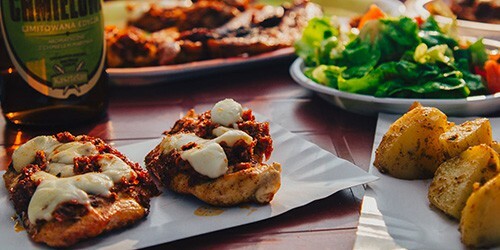 Although they still use quality ingredients for each meal, they’ve made the move to take a simpler approach with their service. They are able to save you money by using digital recipes cards instead of paper, fewer ingredients per dish, and simple packaging. If at any time you need to switch your box, you’re able to do that easily by logging into your account online. So, if you started off with a two-person box but want to include your family in on the Dinnerly fun, you’re able to do so without any trouble. You also have the ability to skip weeks whenever you want. This means you don’t have to feel like you’re locked into your subscription. If you ever decide you need to skip a week or cancel your Dinnerly service, you can do that with ease. No questions asked. Dinnerly really surprised us with how well their meals came out. Usually cheaper meals means bad meals. Not in this case. A big meal delivery service gripe is that they cost too much for the average consumer. It seems like Dinnerly listened to all of the people complaining and made a meal delivery service just for them. Based on our experience, which was very positive, I would say that they might become one of the most popular general meal kits around. It would be a great option for anyone looking to save time and money when cooking (e.g. students, families where both parents work, or even senior citizens). Have a question about Dinnerly that we didn’t answer? Feel free to leave a comment below! If you're looking for the most inexpensive meal delivery service that actually tastes good, Dinnerly is the way to go. Their recipes aren't just delicious, they're quick to make too. This makes Dinnerly one of our favorite meal kits we've reviewed thus far. I have been spoilt by hello fresh and Marley spoon, so innerly was disappointing for me. It wasn’t the packing or the digital recipes, but the bland meals. Unfortunately you get what you pay for. Sorry to hear! Dinnerly meals are definitely more “simple” than some of the other meal kits out there. Hello Fresh and Marley Spoon are both good options for higher-end meals. I had been really loving my Dinnerly experience until recently when my box was never delivered. I have made multiple attempts to reach customer service but phone and email, and yet I recieve no response. It is true that their meal kits are inexpensive and really yummy. Unfortunately, it seems as though there service is also unreliable. Maybe they are cutting corners by not having enough representatives available to respond in a reasonable time frame. So sorry to hear about that, Bethany! I hope they’re able to make it right. Are you thinking about switching to another meal delivery service?